The bottle of Armagnac sat on display near the counter of my local liquor store for over a year. When it comes to spirits, I’m not normally moved by come-hither numbers, but in this case the Chateau de Laubade’s classic 1957 vintage and its $399.99 price tag aroused a kind of lust that wasn’t normal. I was waiting for the slightest, flimsiest justification or provocation to buy that bottle of brandy, which was strange, because until recently I’d never tasted much Armagnac. Then, in late November, I traveled to Gascony, in southwestern France. This was the traditional time of year for distillation, after the annual grape harvest, when production happens around the clock. At night, during these weeks, distillers dine, play cards, smoke cigars and even throw parties right next to their hot stills, which are in many cases still fueled by wood. I went to a couple of such soirees and ate so much rich Gascon foie gras that I feared I might meet the same fate as the geese. 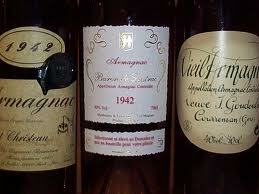 To wash it all down, I drank a whole lot of Armagnac, ranging across many producers, blends, vintages and price points. Decadent? Yes, incredibly so. And it only fueled my new Armagnac desire.